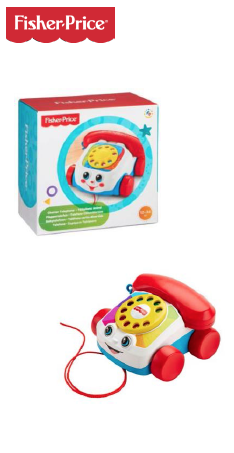 “Ring-ring!” This baby-favorite classic has been dialing up fun since 1961! Adorable pull toy pal has a friendly face, spinning dial, fun ringing-phone sounds, and eyes that move up and down as it’s pulled along. It’ll get baby chatting and strolling like a pro! Baby can sit & play or pull it along. Dial introduces numbers 0-9. Encourages early role play. Zip, zoom, vroom—from one race to the next! 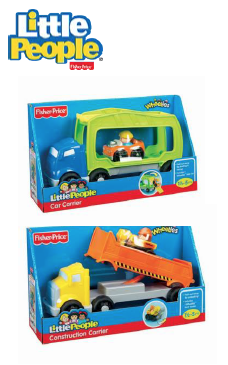 This double-decker style car carrier holds up to 4 WheeliesTM cars! And there’s a fold-out ramp for loading ‘em up or racing ‘em down which is good for finger/hand dexterity. And pushing the car carrier along gets gross motor skills in gear too! One WheeliesTM vehicle included. 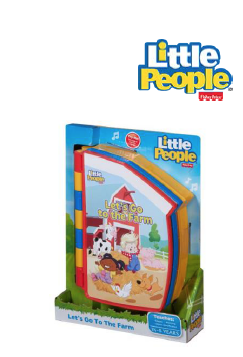 This charming story book reads itself to little ones, engages them with a puzzle piece to place on each page, and teaches shapes, matching and object identification when they place all the puzzle pieces in the right spots on the back page. All in one little book! All aboard! 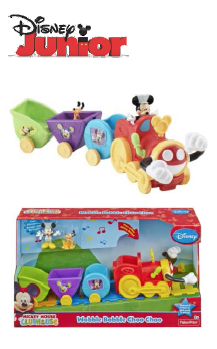 Join the silly train and let’s get movin’ on Mickey Mouse’s wobble bobble choo choo train! Go for a ride and watch the choo choo swivel and sway as it travels along! 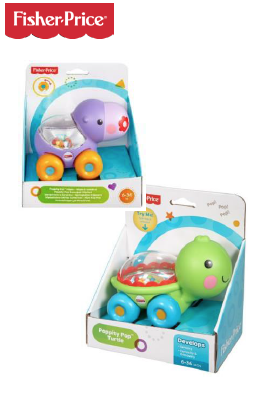 Hear fun phrases, music and sounds as you push him along! Comes with removable Mickey Mouse conductor and Pluto figures. Engine has a dancing motion with arms and face that move as it drives! As it rolls the trains arms move up and down and the cargo cars wobble. Fun phrases, music and sounds are activated when the train is either rolled or the Mickey Mouse head button on the engine car is pushed down. Meet the perfect crawl-along pals for baby! Push these cute characters to make the colorful balls go pop, pop, pop as they roll along. Exciting action and sounds encourage baby to push and crawl along, again and again. 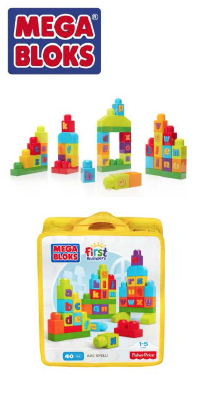 Helps strengthen gross motor skills and developing senses. Introduces cause & effect. Full steam ahead for a Thomas & FriendsTM twist on the classic shape sorter toy! Designed to look like Tidmouth Sheds from Thomas & FriendsTM, this beneficial playtime staple combines a tried-and-true preschool play pattern with the fun-filled world of Thomas. Place the provided shapes into the corresponding openings on the roof of Tidmouth Sheds, and when the star is pressed into the appropriate recess, Thomas will roll out from the center shed door! Children can also manually spin the left and right doors to reveal different characters. Plus, when the circle is placed in the side shed, Sir Topham Hatt pops out! Featuring a convenient recessed back area for easy carrying, and a roof that flips open to remove or store the play pieces, the Tidmouth Shape Sorter delivers a valuable, interactive playtime experience for your child! 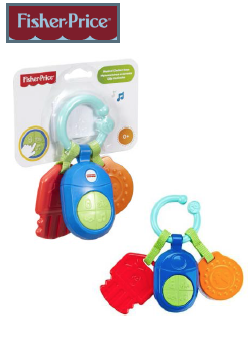 A favorite Fisher-Price® classic toy with so many ways for baby to play! 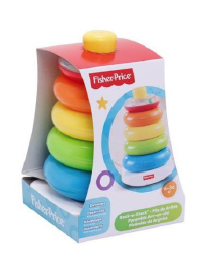 Five colorful rings are fun for younger babies to grasp, hold, shake, and explore. The littlest ring has a shiny, reflective surface for baby to discover inside—with colorful, swirling beads that make fun rattle sounds! When baby is ready to sit & stack, baby can place rings on the post, then bat at the wobbly base to make it rock back and forth. Stacking helps baby develop eye-hand coordination, and introduces baby to the concept of relative size as they learn to sort and stack from biggest to smallest! Ages 6+ months.